The Benchmade Altitude is an ultra light hunter that can do the job of a bigger, bulkier knife without weighing down a backpack. This Altitude features super premium CPM-S90V stainless steel construction, .090" thick, with a Rockwell hardness of 59-61, and an all over non reflective black DLC (Diamond Like Carbon) finish. The 3.08" drop point blade area has a top swedge to lessen weight, a notched thumb rest for secure grip, and a notched area over the tip for precise control on intricate cuts. The slim handle has notches and carbon fiber G10 micro scales for secure purchase, and a lanyard hole. A Boltaron sheath is included. 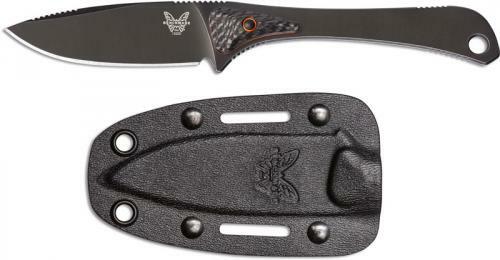 The Benchmade Altitude has an overall length of 7.38", and it weighs 1.67 ounces. Made in the USA. From the Benchmade website: Designed for backcountry adventure; for the hunter who counts every ounce. The ultimate lightweight hunting knife features the incredible edge performance for CPM-S90V blade steel and unique carbon fiber micro scales for dexterity and control not typically found in skeletonized knives. The Altitude™ continues to take hunting performance to new heights. Made in USA.